Bollywood countdown party Singapore a event to welcome new Year 2014 and bid Good Bye to 2013. a ticketed event featuring Indian Live Band Music performance, Two of the local Music Groups will be performing at the event. Open for general public Target Audience is who understand and enjoy Indian Bollywood Music. On the same time its one event which helps in bringing the community together by way of entertainment and harness friendship. Meet new friends and thus improves the socio cultural fabric. The year 2009 saw the emergence a band called Crossroad Traffic. Today after some changes and restructuring the band has emerged as a single window to the world of Indian music. Crossroad Traffic upholds the blend of contemporary music with the rich heritage of Indian music. Using instruments that are usually associated with western music, Crossroad Traffic breathes new life into popular tracks with the ultimate aim of creating a new genre of music that encompasses the entirety of India. Tattva is quintessentially a neo-Indi-Indie Rock band formed in the summer of 2013 in the home turf of Singapore. The five piece act has been steadily making their way into the Singapore music scene with a collection of their own songs in Hindi as well as English. The band has been working hard all these months to come out with something that the Indian music scene of the year 2014 and beyond beholds. The songs stay connected to the roots, that is India and the music brings out the charisma of our homeland. “The primary essence of our music is the song writing and the fresh colossal music that springs it up, magical”, says Prerna, one of the Band Creative heads in Singapore. “We are making music with our full honesty, and the ultimate thing for us is to bring it out on such a cool platform.”, reckons Manish, the other of the duo. 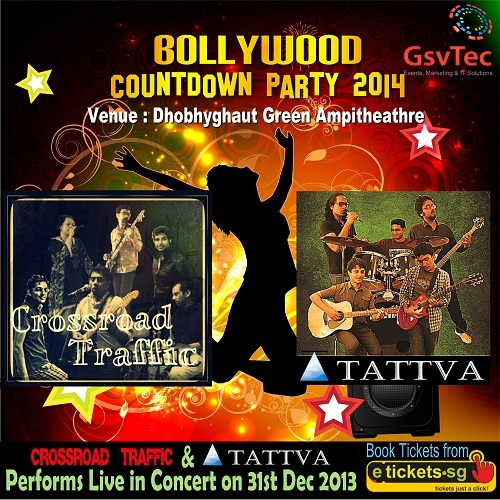 Tattva is going to be on stage live on 31st of December from 19:00 pm to 00:30 am at the Dhoby Ghaut Green Amphitheatre. They will be covering their own act and Desi tracks you have loved all these years. Lets groove all night to welcome year 2014 ! Prerna Sharma & Manish Agarwal , Band Managers. Children above 3 Years need a ticket for admission. Organiser can change the event date, venue. All Participants take complete responsibility of them self and their dependants .Organisers do not take responsibility for any claims for any incident caused directly or indirectly during the event.. Right of entry reserved by organisers.